Working with archival and news footage, director Jason Osder does a masterful job of reconstructing a horrific chapter in Philadelphia history. In May of 1985, the Philadelphia police force squared off against a small group of radicals who called themselves MOVE. Tensions between the police and MOVE — a cult-like organization with its own view of “natural” living — resulted in a tragic confrontation in which a police helicopter dropped a bomb on the house that served as the group’s headquarters. The police and fire departments allowed the fire to burn as part of a misguided tactic designed to force MOVE members out of the house. The blaze eventually consumed 62 homes and resulted in the deaths of all but two of the people in the house, six adults and five children. Osder doesn’t glorify MOVE, and it’s pretty clear that most Philadelphia residents (white or black) wouldn’t have wanted MOVE members for neighbors. Besides digging up sidewalks (to be closer to the earth), MOVE members frequently screamed epithets at their neighbors through bullhorns. Their kids often ran around without clothing. But it’s equally apparent that the police over-reacted in an episode located in a what appears to have been a mostly stable lower middle-class neighborhood. One of two survivors, young Michael Moses Ward is seen giving a deposition that serves as the story’s emotional anchor. As a kid, Ward lived in what only can be described as a war zone. We also hear a variety of testimony given to a commission that was appointed to look into the events leading up to and including one of the city’s worst episodes. 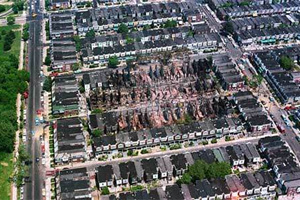 Philadelphia police previously had had run-ins with MOVE members, but nothing to compare with the destruction wrought in 1985. The film is all the more powerful for resisting the temptation to inveigh against an uncaring white community. At the time, Wilson Goode, a black man, was mayor of Philadelphia, and throughout this searing documentary we see plenty of evidence of black presence in the City of Brotherly Love. Osder leaves it to us to draw conclusions about MOVE and the horrible events of May, 1985, one more reason why Let the Fire Burn is entirely gripping from beginning to end.